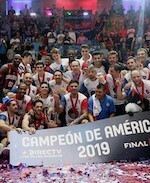 San Lorenzo toppled Arecibo to finish Group C action undefeated. Gabriel Deck (199-F-95) stepped up with 24 points to lead the Argentinean side to the third straight win. San Lorenzo grabbed a 54:29 halftime lead. They never looked back afterwards and rallied to the victory. Marcos Mata (201-SF-86) delivered 15 points in the win. David Huertas (195-G/F-87, college: Mississippi) responded with 12 points and 5 assists for Arecibo. Hebraica topped Bucaneros to seal their semifinal stage appearance. Jaime Lloreda (204-C-80, college: LSU) posted 26 points and 21 rebounds to lead the Uruguayan team. Bucaneros grabbed a 42:41 halftime lead. They extended the lead at 3-point mark heading into the fourth quarter. But Hebraica limited their opponets to just 14 points in the final stanza and rallied to the victory. Michael Hicks (196-F-76, college: Texas A&M-CC) delivered 25 points in the win. Jordan Hamilton (201-G/F-90, college: Texas) responded with 27 points for Bucaneros.